If you have followed our updates you’ll know that Kate has now been in Kikima since the start of Janaury. She has been keeping a blog. Here is one of her postings to describe the Rolling Hills Residence. The largest donation of the month came from Medicine Hat High School in Medicine Hat, Alberta, which raised $1,175.87. Here’s how they did it. On December 17/18, 2009 Medicine Hat High School Student Council hosted their third annual All-Nighter. This year the funds raised were split between The Salvation Army in support of their Christmas Campaign and The Creation of Hope. After seeing Eric Walters speak here at our school we felt this would be a great charity for us to support and became an Alberta sponsor school. Students had to raise/bring $25.00 in order to attend this event with the proceeds going to charity. This event ran from 8:53 p.m. on Thursday December 17th until 8:53 a.m. Friday December 18th. During this time the students participated in a variety of activities including; sporting events (dodgeball, floor hockey, free gym), board games (including a giant twister game), movies, video games, karaoke, hallway bowling, as well as some old school relay races at five o’clock in the morning (3 legged race, egg on a spoon, etc.). The event was very successful in that it was attended by 120 students and 17 teachers/administrators, but more importantly it was a great time had by all for a great cause. This sounded like such a great night I wish I could have been there. Are there any other high schools out there that want to run a night like this? $200.00 was donated by John and Tiffany McGregor as a wedding gift for Luke and Pam Fraser. From their wedding will flow a lifetime of caring. From this gift will flow a water project that will support life in Kikima, Kenya. IDA Pharmacy in Erin Mills donated $100.00. It’s always nice to remember businesses which have made a donation when deciding where to do our personal business. The people at IDA are not just great professionals but caring people! I want to ‘bundle’ together a big thank you for some wonderful writers and illustrators who made donations this month. These include, Deboral Kerbel – a wonderful writer for children and young adults, John Mantha – the talented cover artist for many of my books, John Wilson – a great writer and frequent houseguest when he is touring in Ontario, Barbara Reid – both a great writer and illustrator (I envy her multi-talents so much! ), Marina Cohen – an emerging new writing talent, Loris Lesynski – an incredible woman who’s talent is only topped by her caring nature, and last but not least, Sharon Jennings, who is not only a very talented writer, but drove out through a snow storm to attend our magic night! Norm Epstein made a generous donation of $150.00. Norm is a first class emergency medicine doctor, and a humanitarian and social activist (you can read about him in my book Tell Me Why), as well a talented writer in his own right. He’s one of those people who just knows how to make a difference in the world – both here in our community, and also around the world! My sister Janice Chopty and her husband Art, donated to provide for Naomi’s wish list. This will be used to buy textbooks for school, stationary, shoes, a new school uniform, a towel, pay for her PTA and examination fees, a school bag, two blankets and some new clothing. 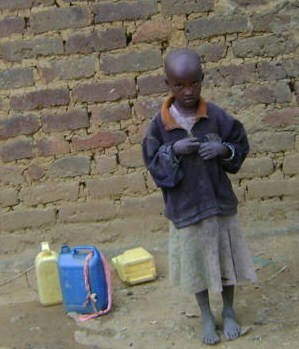 Look toward next month’s update and you’ll see pictures of this young girl with her new possessions. If you go to our Needing Sponsors section on our website you’ll be able to read about Naomi and other young people needing sponsorship and you can also read about their wish lists – maybe you can become the person that makes their wishes comes true! Lorraine Toma-Jones – who seems to get embarrassed every time I sing her praises, provided a donation to cover the wish list for Doureen. Her wish list includes a uniform, medicine to cure ringworm, an additional blanket and mattress, clothes, shoes, stationery and school examination fees so she can be considered to proceed to high school. Lorraine, you’re a model of caring (and that’s why I keep mentioning you) who’s generosity allows Doureen to move toward a healthy future. Graham Fox provided the funds for Christopher’s wish list – this included a uniform, shoes, a mattress, four blankets for him and his cousins, stationery, and textbooks. Graham, your contribution will give this young man the chance to move forward. 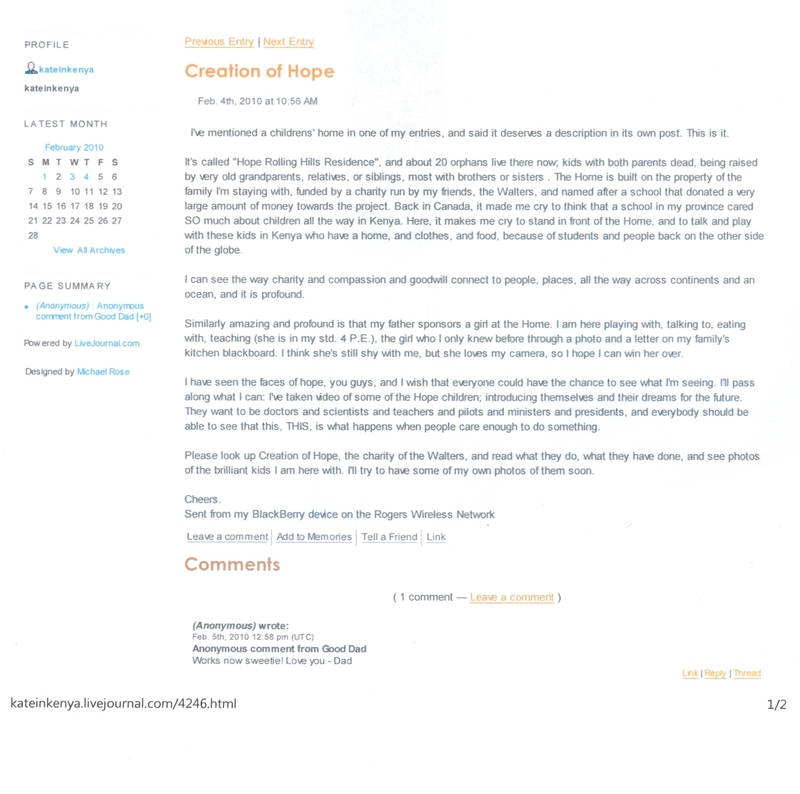 Teresa Gawman has generously offered to grant the wish lists of two children, Mutua and Minoo. 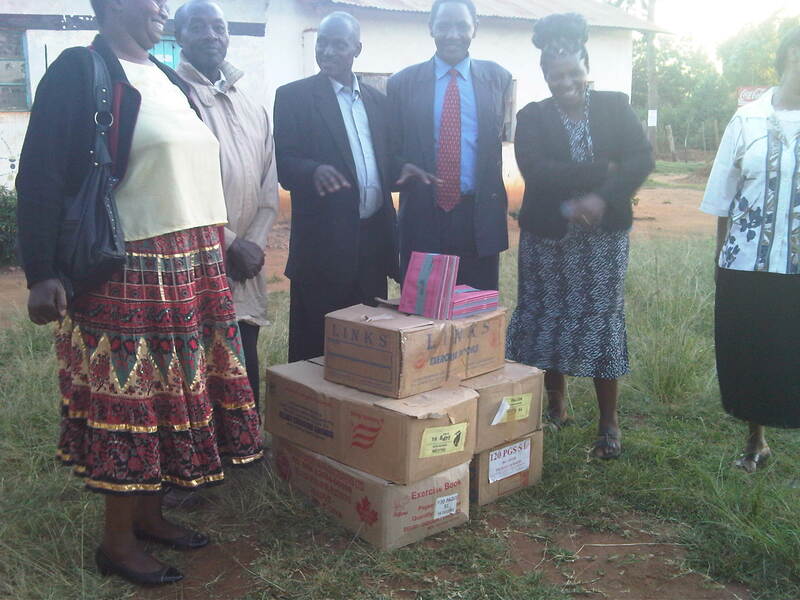 Mutua’s wish list includes textbooks, stationery, a school bag, clothes, uniform and school shoes and socks. Minoo’s wish list includes a uniform, stationery, textbooks, clothes, shoes and toiletry. My birthday is March 3. I’ll be even older. As a birthday present my sister-in-law, Christine and niece, Emily, provided the funds to grant Mugambi his wish list. His wish list includes clothes, a mattress, textbooks, beddings, shoes, socks and stationery. We have received a donation for another goat. Val Chanady has asked to have his goat named Grace after Val’s granddaughter. So Grace she is! Crystal Dumitru – is who is leading fundraising at her high school, Highland Secondary School – and her husband Eric Quist made a donation of $60.00. When I first saw the pictures of Muthama’s rabbit hutch and heard of his dream of breeding rabbits so that he could support himself and his grandparents, my heart went out to him. 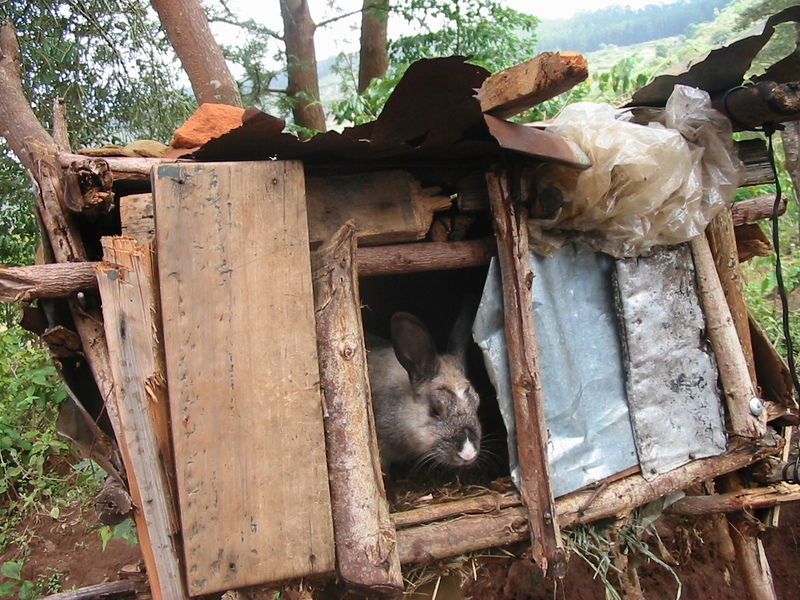 Here was a young man with a plan but he had only scraps of wood and plastic and metal to try to make it all happen. When we talked to Marie Campbell about our hopes to build him a new hutch, she and her husband, Bruce, generously provided $100.00 so that we provide him with a new hutch – three levels for the buck, the does and the babies – and we’ll help stock his hutch from our rabbit hutch (the basement of Rumsby’s Kids’ Goat Academy) . When this new hutch is completed we’ll show you all the pictures. One of our sponsors, Fred Dawber – who will be in Kikima when this is posted – talked to his good friend Elliot Shendale at Macfarlane Nameplate about his upcoming trip. 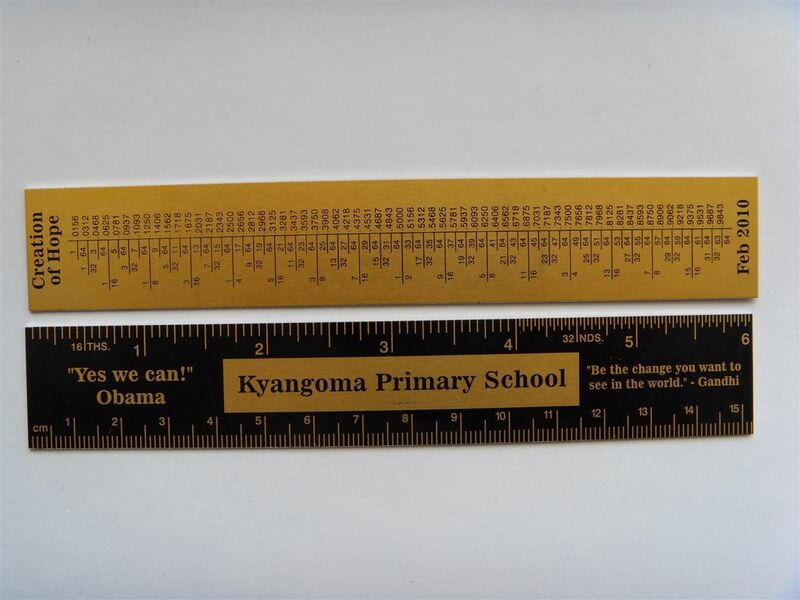 Elliot generously made 500 special rulers for absolutely free so every single student in Kyangoma Primary School has their own ruler. Notice not only the school name but a quote from both Gandhi and Obama – whose father was Kenyan and is a hero in Kenya! Fred is part sponsor – part pack mule – as he is taking over these five hundred rulers, tons of sporting equipment, gifts from many of the sponsors, books, clothing and lots of other special requests from his daughter, Kate, who has been telling him what the kids need. The only thing that is bigger than Fred’s bag is his heart! On February 18th and 19th two big literacy events were held in Toronto. Over the course of the two days close to 1400 students from the Toronto District School Board heard presentations from Paul Kropp – www.paulkropp.com, Kathy Kacer – www.kathykacer.com, Shane Peacock – www.shanepeacock.ca, Ken Oppel – www.kennethoppel.ca, and myself. In addition they went to ‘break-out’ sessions that included presenters from Me To We, Adrian Bradbury from Athletes from Africa, and author Marina Cohen – www.marinacohen.com. These two days were funded by a donation from TDSB to The Creation of Hope. Special thanks to all the speakers who donated their time as well as the organizers and volunteers – headed by Sharon Mills and Lisa Weaver and included Ann Perez, Cindy Matthews, Maureen Casey, Jenifer Borda, Katrina Papulkas, Gord Fong, and John Arnold – who made all of this happen. They were great days for literacy, great days for students from the TDSB, and great days for the kids of Kikima! 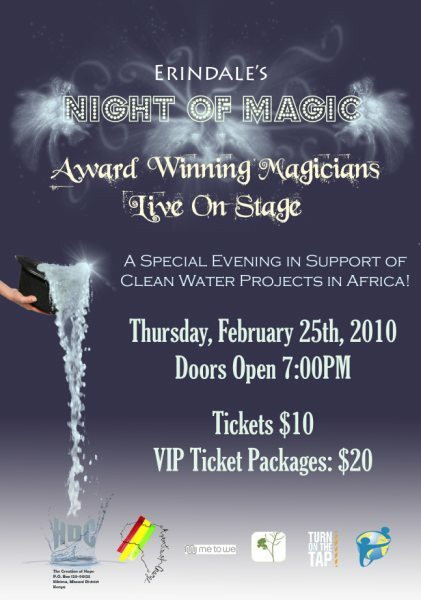 On February 25th Erindale Secondary School in Mississauga hosted a magical night. This event, under the direction of teacher/magician/mentalist James Biss and his Agents of Change club, raised money for The Creation of Hope as well as for a Me to We trip that will take place this summer for members of the Agents of Change. A number of very talented magicians gave of their time and talents. Special thanks to David Peck, Bobby Motta, James Alan and Jason Palter. I gave up trying to figure how these gentlemen performed their magic. What’s equally magical is how their talents produced results that will change the lives of children half way around the world. That’s a very special trick. If you hear about any of these talented gentlemen performing in your area please, please, go and see them in person – you will be amused, amazed and mystified! Food distribution happens – as always – every two weeks. This month there was a deficit of $156.00 between the money we raise through sponsorship and the cost of distributing food to the families in the community (and at Exodus Children’s Home). This was provided by the money that was donated by Medicine Hat High School. Work continues on the Toor Education centre which will hopefully be operating soon. This is Eric. 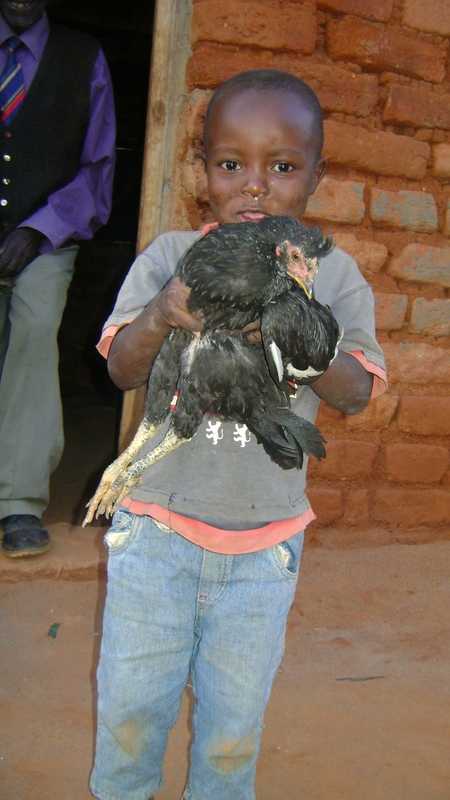 His sponsor family provided money to buy one chicken and build a coop. Lancaster school provided the funds for two more chickens and Aldergrove P.S. paid for two more. These five chickens . . . life is going to be so different for this family. The Hope Home – Rolling Hills Residence – was originally conceived of being the home to 16 orphans. This month we admitted our 23rd and 24th children – brother and sister, Muthina and Muthoka. Muthina is already sponsored and we’ll look for sponsorship for Muthoko. Originally we thought we could support both in the home of their grandparents but circumstances meant that this wasn’t possible. We know there are limitations to how many children this small home can hold – and we’re probably at that limit – but it’s hard not to find a space for children in desperate situations. The heart of this program is our matron, Serah. She is 37 and her husband, Musyoka, passed away in 2006 after a lengthy illness of the liver, leaving her with four kids to raise on her own. Her first born, Dennis Musyoka is 14 years old and is in Form 1 at Mbooni Boys Secondary School, which is a boarding school. He has a fees balance of Ksh. 1,700 and also needs an atlas, Kiswahili Fasaha, school bag and a pair of black leather shoes for school. 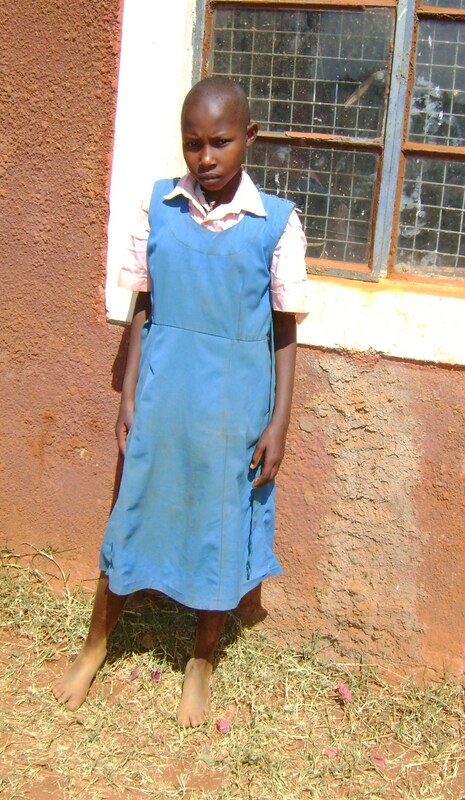 Her second born, Mwaka Musyoka, is 13 years old and is in Standard 6. She has a fees balance of Ksh. 400. 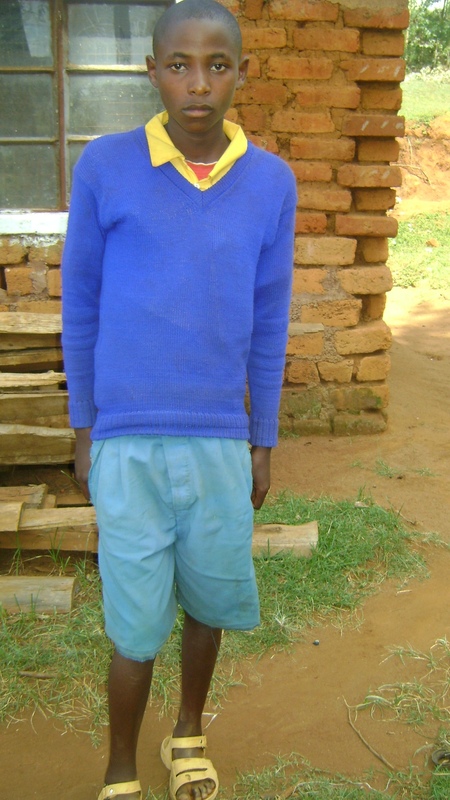 Her third born, Kioko Musyoka (male), is 8 years old and is in Standard 4 at Ithemboni Boys Primary School. He has a fees balance of Ksh. 400. Her last born, Charity Musyoka (female), is 7 years old and is in Standard 1 at Ithemboni Primary School. She has cleared all the fees for Standard 1 but has a fees balance of Ksh 1,000 for nursery school. Because Serah has so many kids in the same school, she was allowed some time to clear up this balance. Before Serah got this job at CoH, she used to do casual labour, tilling peoples land and selling lessos/khangas from her house or in the market place. Her children now stay with her late husband’s 37 year old brother and his wife and their three children. Serah’s 75+ grandmother also lives with them. She has been a widow since 1972 and she used to depend financially on Musyoka. We have made a decision that we need to also help the children of our matron – we have provided $60.00 from Aldergrove Public School to clear up all due school fees for Serah’s four children. Serah is such a wonderful person who provides such excellent care for the children of Rolling Hills that it is our obligation to help her children. We have discussed that when we are able to expand our residence, an additional room will be provided so that Serah’s children can also reside in our setting. She receives a salary of $100.00 per month. Her wages for the months of December, January and February are being provided by The Global Perspectives Program at Innisdale Secondary School in Barrie. Ruth and Kay have been actively working to identify orphans in the community who require ongoing sponsorship, as well as creating a ‘wish list’ of things that would cause an immediate improvement in their lives. The three newly sponsored children were taken from this list of 18 children, as well, other children’s wish lists have been already granted. Ray Lewis Public School under the leadership of Sandi Inglis provided funds for school supplies to be donated to the school where most of our children attend. Here’s part of the delivery of supplies. Your pennies have made a pile of difference in Kikima! Muthina lived in the community with her grandparents. When her mother passed away, her body was brought home for the funeral by the father. He subsequently left, leaving behind their two children, Muthina and Muthoka in the care of their maternal grandparents. Muthina’s age is not known as there are no birth documents or school records for the two children. They also don’t have the mother’s death certificate. All that is known is that Muthina is younger than her brother. The grandfather retired 12 years ago and feels unable to give these children the life they deserve. As you have already read they have now been moved to the Rolling Hills residence. Fred Dawber is Muthina’s new sponsor. He will be in Kikima at the end of February and the start of March to spend time with his daughter, meet his sponsored children, become a welcomed member of the Kikima community and to bring small presents from some of the other sponsors to their children. Ndiso is 13 years old. He lives with a kindly neighbour as there is no extended family. He was born in 1996 and his exact date of birth is not known. He is in standard 6 and in his last exams, he was position 14. He has been among the top 7 in all his exams, but has been dropping in his performance. He seems to be having psychological problems as he has been moving from one relative to another. At the time of the interview, he revealed that he has been living with a kindly neighbour since August 2009, whose own children are all grown up, and she treats him like a son. He sleeps in the family compound and shares a bed with one of the guardian’s grandson, Tony, who is in standard 8. His mother passed away in 1999 and his father followed in 2002. He told us that his relatives were being abusive towards him and did not feel comfortable living with them. He has one other brother in standard 7, who also lives in a nearby household. The two brothers were given a mattress and blanket by another sponsor but they were left in a relative’s house when they were chased away from there. They were also given a goat but it got sick and died. The children were left with a 1 acre piece of land by the parents although due to family conflict, there is fear that it could be sold and the proceeds squandered. Ndiso is sponsored by Lynda Martin and her support will allow him to not only survive but grow and thrive. Teddy was born on 19th June, 1999 and is in standard (grade) 7. He lives with his grandmother and two cousins. On their 1 acre piece of land, they plant maize, beans and trees. Their only other asset is 2 hens. The grandmother earns a meagre income from carrying water to households and day labour on farms. Teddy’s aunt used to supplement the grandmother’s income but she was poisoned by a co-worker and died in 2007. The aunt also left behind a daughter, who lives with an uncle. In school, Teddy used to be among the top five, but he dropped to 17 out of his class of 32 students because he does not attend school regularly anymore. He looks for work to supplement what his grandmother earns. The house is made of brick and iron sheets and he sleeps alone on a wooden bed. He has two blankets and an old mattress. 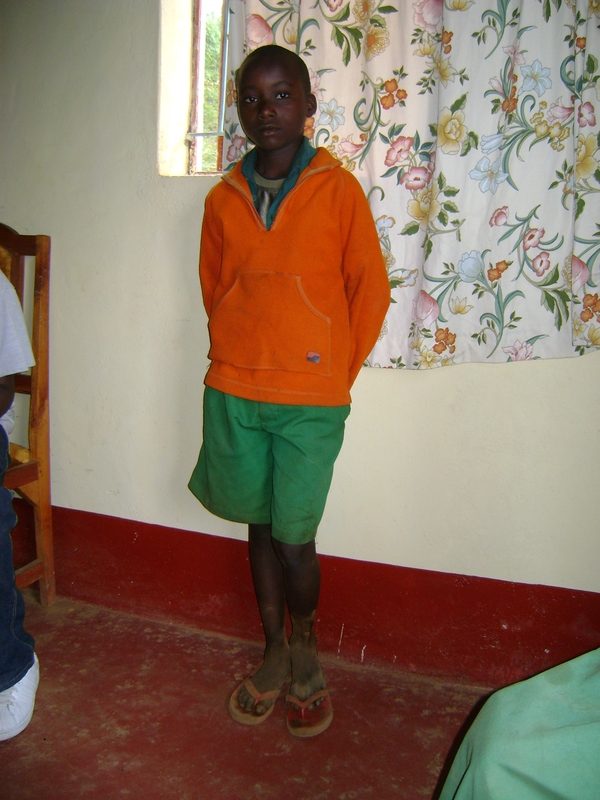 Teddy is now being supported by a sponsor in Kenya Mr. Ngao Mang’ati. He is also the co-sponsoring Mwikali with Kay. I’m looking forward to shaking his hand (and giving him a hug) during my next visit to Kikima. This is an exciting trend that is developing as Ruth and Kay seek out people in their country who are becoming active partners in the program. Kamutu was born on August 29th, 1996. Kamutu’s father was the first to pass away and then the mother followed in 2000. She is in standard (grade) 5 and lives with her two brothers, two sisters and a sister-in-law. The oldest brother, Joshua Kyalo, is 28, married and is also the head of the house. He is self-employed as a bicycle repairer and on a good month, he can make up to $70. This is what he uses to take care of everyone in the house. The second born, Muendo Kyalo, is a standard (grade) 2 drop out, who is now a pool table attendant. Dorcas Katindi Kyalo, the third born, did her standard (grade) 8 exams last year and is waiting to join high school in February 2010. Syombua Kyalo is 11 years old and is in standard (grade) 3. On their land, they plant maize, beans, cassava, potatoes, onions and kales. They own 2 cows and 13 chickens and have farm tools. When they don’t get a good sustainable harvest, they sometimes sleep hungry. The house is made of brick and iron sheets. Kamutu sleeps on a broken bed with her two sisters. The roof leaks and the bedroom is very squeezed for the number of people sharing it. They use a tin lamp to read at night. Kamutu suffers from recurring pneumonia and has sores on her body. In the last exams she did, she was position 12 out of 37 students in her class. Her wish list includes washing detergent, text books, a mattress, blankets for all the children, exercise books, stationery, uniform, clothes, shoes, food (sometimes eat only once a day) and toiletry. The sponsorship will help ease the food shortage. All of the remaining items could be purchased for $125.00. Her sponsor, Ruth, is not only providing ongoing sponsorship, but has made a donation to provide all of the items on Kamutu’s wish list.